Over on docrafts, the blog topic today is "What are you thankful for". Isn't that obvious? I'm more than thankful for discovering crafting which is mainly due to Lady. Without Lady I'd never have gotten into crafting as much as I have. Without crafting I'd spend a lot more hours of my days rather bored! Crafting gives us more reason to spend time together. Shopping trips turn into "hunt the craft shop" trips, whilst meeting for coffee has turned into "let me show you my latest project"!! Crafting even allows us the ocassional weekend trips away to exciting places like Birmingham!! Ok, I'll admit Birmingham may sound rather dull, but in the crafting world it's a pretty big thing as it's where we get a lot of ideas and spend a heck of a lot of money on all new crafting toys whilst sharing good times and giggles along the way. 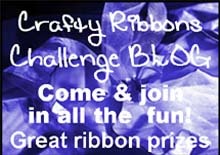 If you're as lucky as us you'll even get the odd freebie or two from our friends over at Crafty Ribbons . Not that we ever expect it to be free ... it's more that Ali doesn't let us pay!! They really were as yummy as they looked!! You can find the post Ali featured them on here. It was a bit of a last minute request as it was needed for just two days later. Thankfully I got it finished in time, and I think it turned out rather well. Today is Jennifer's 30th birthday. We hope you've had a lovely day Jennifer and liked your card as much as us. Fabarooney! Cakes look devine & the card is darling! A Month Of Posts ... Not Quite Cake! A Month Of Posts ... Aloha! A Month Of Posts ... Mint! A Month Of Posts ... On A Stick! A Month Of Posts ... To Canada! A Month Of Posts ... Too Early? A Month Of Posts ... Hello! A Month Of Posts ... Operation Don't Tell Dad! !